Greatly enhancing the skyline of Kandivali, a fast developing suburb of Mumbai, is Shapoorji Pallonji Alpine . On offer by the reputed mega builders of Mumbai, Shapoorji Pallonji, and this residential apartment project has luxurious and aesthetically designed apartments? The project spreads over 54 acres of prime land, which has numerous world-class residential and commercial spaces coming up, making it a much sought after region to invest in. Shapoorji Pallonji the renowned real estate builders have delivered landmark projects both in India and abroad. They are praised to have built the 60 storey residential towers in Mumbai. Magnificent two high-rise towers will be surrounded by scenic landscaped areas to give the inhabitants a life amidst nature’s calm. Inhabitants will experience a life full of convenience, modern amenities, spectacular views, and a beautiful environment. Spacious 2 and 3 apartments at Shapoorji Pallonji Alpine Mumbai have sizes ranging from 768 sq. ft. to 1047 sq. ft. The Vaastu-compliant apartment interiors have plush finishes with modern vitrified &laminated wooden flooring, branded sanitary fittings, video door phone, emergency button alarm, and earthquake resistant RCC framed structure. The apartments are planned to allow ample ventilation and natural light. Lavish external amenities make this project an enviable address witha grand club house which includes a multi-purpose hall, gymnasium& steam room, indoor games, a kids’ play area, an area for senior citizens and tracks for jogging. Hassles of everyday life can be avoided here with 24-hour power backup& water supply, professional security services, reserved parking, and high-speed elevators. The location of Shapoorji Pallonji Alpine Kandivali is strategic with important roads like Malad-Andheri Link Road, Mulund - Goregaon Link Road, S.V. Road, Link Road, and Western Express Highway enhancing its connectivity. Kandivali East is surrounded by famous heritage landmarks like Churchgate, Bombay House and David Sassoon Library along with reputed schools, colleges, restaurants, multi -specialty hospitals, and business hubs like Goregaon - Andheri - Malad–Mindspace, Powai, and BandraKurla Complex. Kandivali Railway Station is just 4 kilometers away, the domestic and international airports are just a 30 minutes’ drive and Borivali Railway Station is just a 10 minutes’ drive from here. Ranging from Rs. 2.04 cr to Rs. 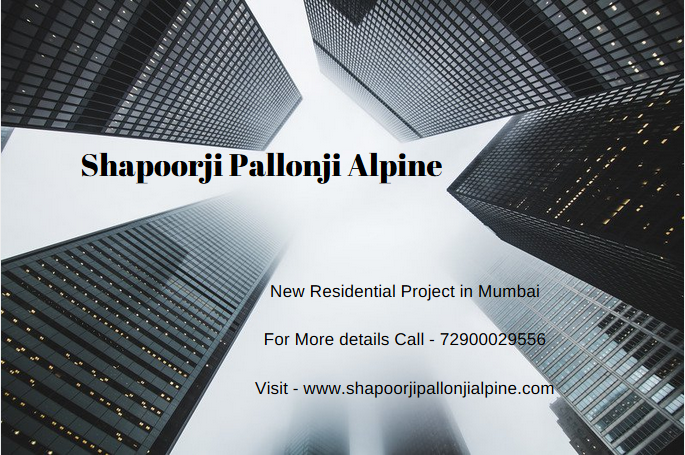 2.65 cr, the Shapoorji Pallonji Alpine price is extremely attractive considering the multifaceted lifestyle one gets in return.On offer are various payment plans to make it easy for the aspiring home buyers and also the realty investors. Shapoorji Pallonji Mumbai Dreams is new pre launch project located in Mulund Mumbai.